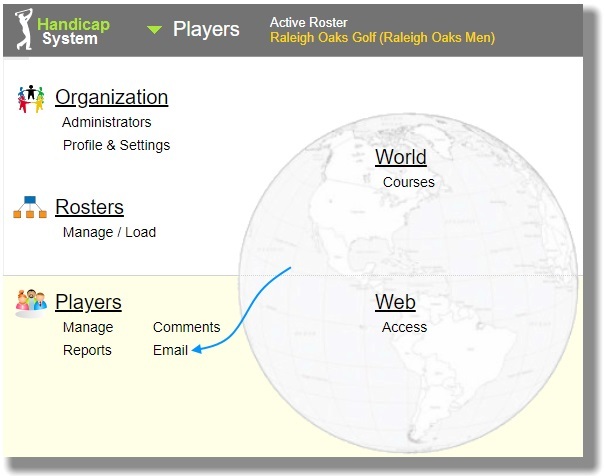 The email system allows you to send emails to one, many or all of your golfers. 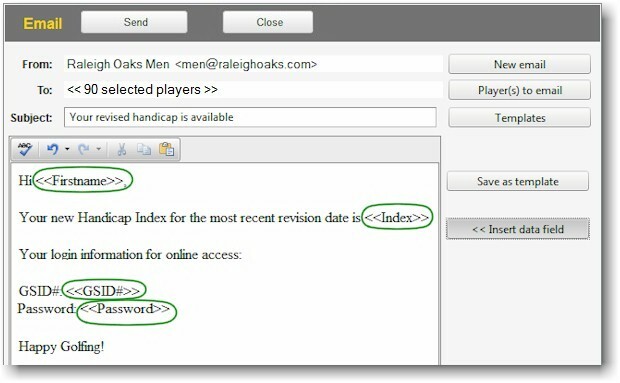 You can create unique messages each time you send an email, or you can save (multiple) email templates to use repeatedly which can automatically fill in information such as player name, current handicap, etc. One of the email templates you will want to send is how to access their information online. Fill in the "From" Organization Name (could be a person's name) and Email Address. Click on "Player(s) to Email" button. The following window appears. Select players to whom your email will be sent. Note: you can do this after you have composed your message as well. Depending on how many golfers you have in the Roster, this list may be on multiple pages. Make sure you select golfers - or deselect - on ALL pages. Click on the First Page, Previous Page, Next Page or Last Page icon to move from page to page. Select or de-select all names by clicking the check box to the left of the "Name" column header. Email only one player by leaving a check mark in her/his box only. When you have selected the players you want to email, click on Save button. Type in the Subject line and your message. Use merge fields to fill in information automatically. Note: You can insert "merge" fields which automatically fill in players' information. Click the Insert Data Field button and select the information you wish to merge. In the example below, the <<FirstName>>, <<Index>>, <<GSID#>> and <<Password>> will automatically fill with each recipient's unique information when emails are sent. When you have composed your message and selected the player(s) to whom your email will be sent, click on the Send button in the image above. If you are emailing more than one player, the Preview Emails window will appear. Click the Send Emails button to send your emails.